1. Blend “Eyeshadow Helper Waterproof Primer” by Lime Crime all over the lid. Apply “Native” by Motives Cosmetics throughout the crease. Followed by “Saddle” from Mac. 2. Apply “Brown Script” by Mac to the crease and blend. 3. Apply “Truffle” by Motives Cosmetics to the inner crease for a smoother transition. 4. Pat on “Little Black Dress” gel liner followed by “Raven” shadow from Motives Cosmetics. Blend upward until transition is seamless. 5. Create liner using “Crystal Silk” glitter liner by Nyx Cosmetics. Start off with a thin line until you have your desired thickness. Lightly apply “Geri” loose glitter by Violet Voss on top of liner for maximum effect. Apply “B178” lashes by Eldora Eyelashes. 6. 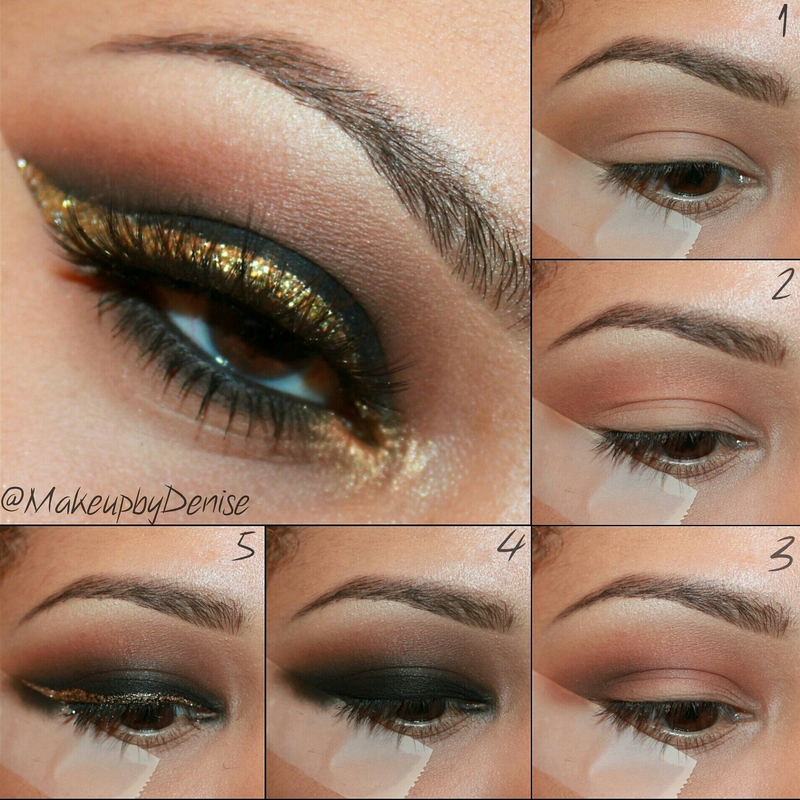 Apply Antique Gold by Motives Cosmetics to the tearduct. And blend “Saddle” & “Raven” to the lashline. Lips: “Close Contact” lipstick by Mac. “Naked” & “Tender” liner by Motives Cosmetics. What are some of your favorite glitters? This entry was posted in Inspiration and tagged beauty, glitter, lashes, makeup, pictorial, smokeyeye by makeupbydenise. Bookmark the permalink. 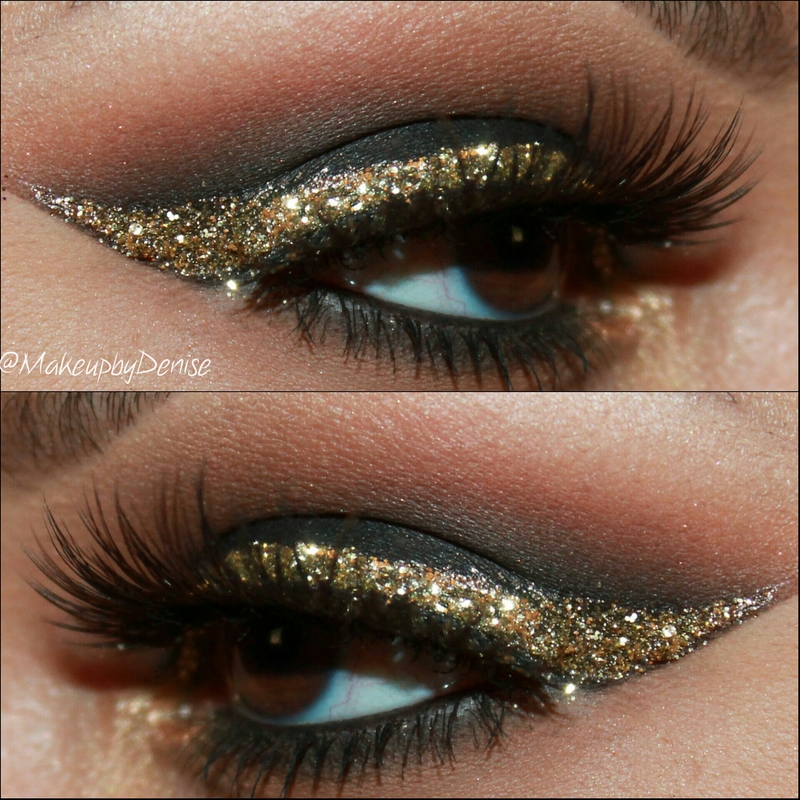 Love the gold, I’m always looking for ways to add glitter so I’m going to have to try this! Denise I’m very impressed with your work! Can you please do my makeup for my wedding? I sent you an email today.